A unique and diverse group of African American men are collaborating to create and execute a plan of grass roots solutions to socio-economic challenges facing many in the Memphis and Greater Mid-South communities. 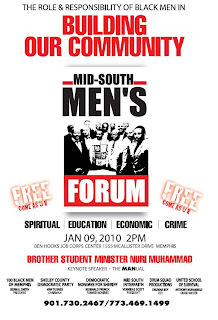 On Saturday, January 9, 2010 from 2:00pm- 4:00pm, the Mid-South Men’s Forum will be held at the Ben Hooks Job Corp Center located at 1555 McAllister Drive in the Whitehaven area. The keynote address will be delivered by Nation of Islam Student Minister Nuri Muhammad of Muhammad Mosque No. 74 in Indianapolis, Indiana. Following several small group sessions to establish an initial plan of action the Forum is being held to engage men throughout the Greater Memphis area to enhance the plan and move toward implementation. From the initial responses men from varied backgrounds and experiences, including the faith-based community, business community, education community, non-profit/social services, law enforcement, music and entertainment will all be represented. The men will come together at this initial Forum to establish or enhance existing sensible and effective short and long term solutions to challenges ranging from economic disparity, educational deficiencies, crime and safe communities. “It is our intention to bring together men that are sincere about improving their communities, not to rehash the problems, but to focus on solutions and plans that allow us to rebuild and improve the communities in which we live” stated Brother Anthony Muhammad of the United School of Survival. The event is been hosted by a diverse and dynamic group of leaders including, Van Turner, Chairman of the Shelby County Democratic Party, Bernal E Smith, II, President of the Greater Memphis Chapter of the 100 Black Men of America, Veniras Scott, President of Mid-South Interfaith, Drumma Boy, CEO of Drum Squad Productions and National Recording artist, Reginald French, former City of Memphis Executive and Democratic Nominee for Shelby County Sheriff and Anthony Muhammad, Grand Master of the United School of Survival. The initial plan includes three primary aspects at this point. The first is the creation of a Loan Pool/Angel Investment Fund for minority business owners through the establishment of a cooperative savings club. The plan also calls for community canvassing and an increased presence of well intentioned African American men in the most challenged neighborhoods. The plan calls for the adoption of one or two of the most severely challenged and under performing schools in the Memphis City School system to provide mentoring, support and presence. The conveners are open to adding to this initial plan but are careful not to try to do too much too soon even in the face of overwhelming need and desire to impact. “We want to focus on those things that are tangible, measurable and immediately addressable without a lot of “red tape”. We don’t want to try to solve every problem in one day but to smartly address those that we feel we are best equipped and resourced to handle given the aggregation of talent that we are organizing,” according to Van Turner, attorney and Chairman of Shelby County Democratic Party. The Mid-South Men’s Forum is a unique, collaborative, grassroots effort of Men working to address socio-economic issues that plague communities throughout the Mid-South area. 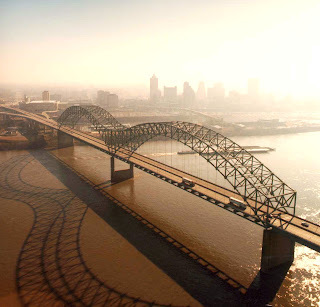 The participants will work together to establish smart plans and then execute those plans towards improving the quality of life for Mid-South residence. Men of all backgrounds, faiths, and walks of life invited to participate in the meeting on January 9th and in the ongoing efforts.